Four presentations from this meeting are available - Diagnostic: NGS panels versus WES by Martina Wilke, Microcephalies: MRI clues by Nadia Bahi-Buisson, Human Brain Organoids in MCD: The Example of LIS1 by Orly Reiner, and Syndromes associated with brain malformation - dysmorphology by Renske Oegema. 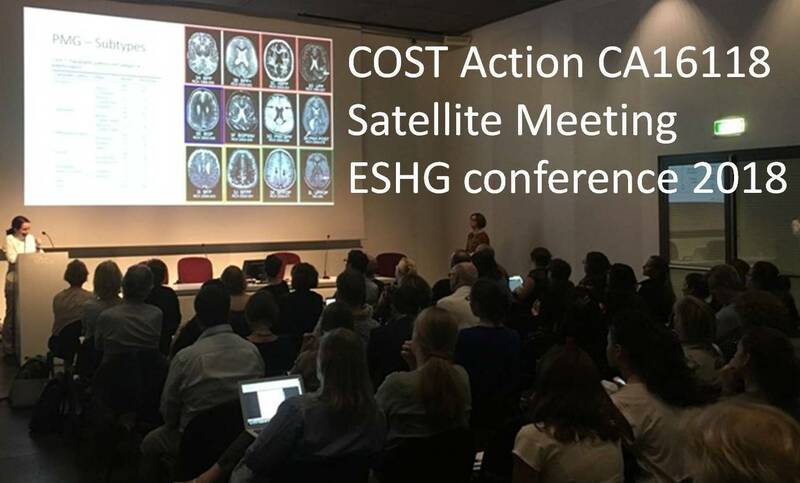 The initiative for this satellite meeting comes from the European Network on Brain malformations Neuro-MIG. This consortium is supported by the European Committee for Science and Technology (COST Action CA16118). The aim is that by giving an overview of the clinical clues to recognize and diagnose malformation of cortical development (MCD), Neuro-MIG stimulates discussion and broad participation to most relevant unsolved issues in genetics. With the advances of “unbiased” genome wide analysis, often leading to detection of unclassified variants, there is an increasing urge to develop skills in reverse phenotyping, essential in the clinical genetics practice. This is a complex task when approaching the field of brain malformations, which involves multidisciplinary expertise and requires the geneticist to gather information of very different kind, e.g. from neurology, pathology, neurophysiology, morphology, ranging from brain imaging to clinical dysmorphology. The goal is to illustrate the state-of-the-art distinctive patterns that can be recognized with a high degree of certainty as related to specific genetic causes and MCD syndromes. Distinctive anomalies can be recognized ex-vivo at the anatomical and pathological level, but also in vivo by dedicated MRI imaging, by electrophysiological characteristics or dysmorphology clues. Also the main types of genomic techniques and the advantages of custom-designed NGS panels versus whole genome/exome analysis will be reviewed. All presenters are members of the Neuro-MIG. Stakeholders are clinicians and research scientists from different medical and pre-medical disciplines and different career status who are involved in diagnosis and care of people suffering from brain malformations or have brain malformations as scope of their research. We hope that participants involved in patient care will be able to make use of the information in the daily practice. On behalf of the Neuro-MIG, I hope to welcome you in Milano! A programme for the meeting is available here.